Years in the League: This is my first active year! I was a new member in Fall of 2017. 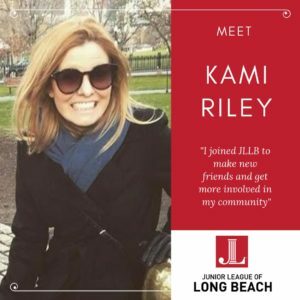 Why You Joined: I joined the Jr. League to make new friends and get more involved in the community. Success on both fronts! What You Do Outside of the League: I recently received my license to practice law in California, and I’m excited to transition back into active legal practice! Currently, I work at an apparel design firm where I oversee bulk production, HR, and an assortment of different operational processes. Most of my time is spent working with our global manufacturing network to solve development and production problems without impacting our customers. I enjoy running, hiking, backpacking, stand-up paddle boarding, and yoga. My goal is to complete a 200-hour yoga teacher training program. An Interesting Fact You’d Like to Share: When I was in middle school, I lived in Germany for two months. While I was there, I learned conversational German by watching Sesamstrasse, the German version of Sesame Street. I also saw David Hasselhoff in concert! His popularity in Germany is NOT overstated. They love him there! About a decade after my summer in Germany, I saw David Hasselhoff at LAX. He did not remember me from Kinderfest ’92. One of Your Favorite Websites and Why: Book of the Month Club, and yes, I am a member. If left to my own devices, I will read psychological thrillers exclusively! Book of the Month gets me out of my reading rut. My personal rule is that I can only pick the psychological thriller every other month. I don’t always finish the non-thrillers, but I pat myself on the back for making the effort. Right now I’m reading Early Riser, by Jasper Fforde, which was my non-psychological thriller pick from February. I’ll let you know how goes! Also Amazon. Amazon is my personal playground. I could probably retire right now if it were not for Amazon Prime! Just kidding. But not really. My favorite Amazon purchases are my acupressure mat, my ivory faux fur throw, and my blue light blocking glasses! Have a good Amazon recommendation? Send it my way!